Air cushions provide inflatable seat padding for general comfort and more serious medical requirements (bedsores, sciatica, degenerative disc disorder etc.) (Source). 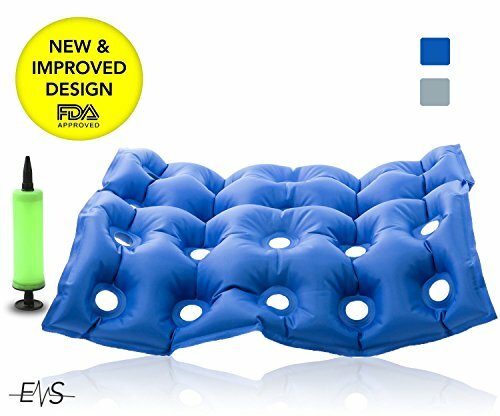 The inflated cushion helps to distribute your weight across the surface of the air cells, alleviating pain, discomfort and skin breakdown. One high-end example is the the Roho cushion, which is built from clusters of small, rubber air cells that are arranged in tight rows. Sitting pressure is distributed by air shifting within these air cells, evenly spreading out the pressure against the sitter's skin (Source). The advantage of air over gel is that since the whole air cushion 'system' is closed, the air flotation cells don't flatten out the way gel cushions do (Source). Sometimes it makes sense to consult with a physician or your rehabilitation therapist to get a recommendation about which cushion is the best option for your needs- especially in the case of pressure sores. Let's take a look at 5 of the best-selling air cushions on the market and see how they compare. Doesn't flatten, as long as it's adequately inflated. Good for pressure sore management. Air pumps let you inflate it to your needs. Not as stable as gel cushions. Higher likelihood of air leaks & punctures. Requires more maintenance to ensure optimal air pressure. This premium air-inflatable cushion offered by EMS is comfortable, foldable and suitable for after surgery recovery. Users love that the pillow inflates quickly, but some do note that the air pump arrived broken. This air seat cushion is made of durable, lightweight material that is specially designed to prevent air leakage, and it has small ring-shaped holes to distribute weight evenly and an anti-bacterial vinyl cover, which is water-proofed and easy to clean. The inflatable seat cushion fits any structure, and since it’s foldable, you can take it wherever you go. Overall, this is an excellent choice for a pressure-relieving pillow- even for air travel. A customer shares that his mother started feeling better only after two days of using the air seat cushion and that it’s ideal for bedsore. The reviewer also states that the cushion arrived quickly, and he is impressed with the quality. Another happy buyer mentions that it takes him about a minute to inflate the EMS cushion and that it keeps his back from getting stiff. A satisfied purchaser, who is also disabled, also adds that if you spend the better part of your day sitting, this is a necessity for you. The buyer also says that the inflatable cushion seat is perfect for scooters or wheelchairs. However, some customers have complained that the air pillow is not very durable and that it loses its ability to stay inflated after a couple of months. Some users also note that the cushion is hard and that it slides off the chair. This air-inflatable air cushion offered by Drive Medical is well-made, well-balanced and useful for preventing pressure sores in the elderly and disabled. Users love the elegant black design, but some do note that it’s expensive. This air cushion seat measures 20” x 22” x 4” and it has a weight of 6 pounds. It provides optimal pressure redistribution to increase blood flow thanks to its interconnected, independent air cells. It has a water-resistant, low-shear stretch cover, which has adjustable straps. The air pillow also has a non-skid bottom so that you don’t have to worry that the cushion will fall off your chair. 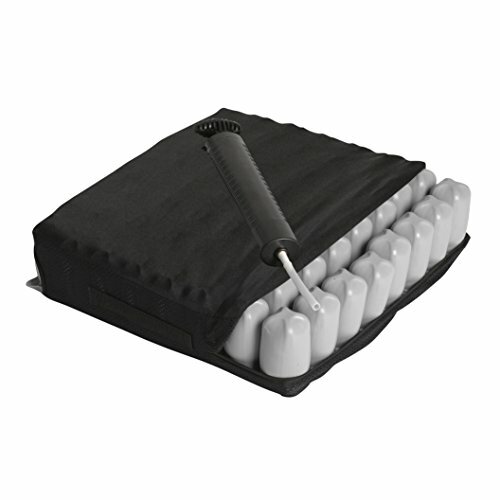 The package also includes a hand pump, and you can use it to adjust the cushion until you feel comfortable. 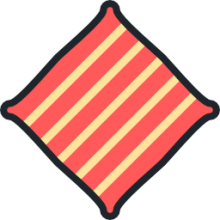 Overall, this is a product of top-notch quality, and it could be invaluable to those that spend long hours sitting in one place. If you are looking for a comfortable wheelchair air cushion, you might take a look at this inflatable pillow seat offered by Roho. Users love the high-quality design, but some do note that it’s quite expensive. This low-profile air cushion measures 18 x 16 inches, and it’s made of durable flame retardant neoprene material. It has a weight of 2 ¾ lb, a counterpressure surface, a two-way stretch cover, and a 24-month warranty. Both the cushion and the cover are machine washable so that you won’t have any problems cleaning it. The package also includes an air pump and a repair kit. A user shares that the Roho wheelchair cushion is comfortable and easy to mend when it starts to leak. The reviewer also adds that the customer support is helpful and responsive. Another happy buyer mentions that he doesn’t go anywhere without his air-inflatable cushion and that she had to repair the pillow only once for two years. She highly recommends this low-friction option for anyone looking for the best cushion for pressure sores. A purchaser also states that his dad has been using the Roho air cushion for six months and he feels much better and less sore. However, some customers have complained that the Roho air-inflatable cushion is not durable and that they had to have it repaired often. A user also complains that he received the wrong size and had problems to return it to the merchant. This inflatable air cushion offered by Roho is light, easy to inflate or deflate, and useful for long driving trips. Users love that the pillow is very comfortable, but some do note that it’s smaller than they anticipated. This ‘trucker’ air cushion seat measures 20 x 20 inches and it’s made of interconnected air cells that distribute the body weight evenly. You can adjust the shape by redistributing the air flow until you achieve the desired comfortable position. The Roho air cushion weighs only 3 lbs, and it has a machine washable cover made of breathable nylon and Lycra. In general, buyers are pleased with the Roho truck comfort cushion, and they praise its design and usefulness. A purchaser states that it’s easy to adjust the firmness of the cushion by releasing the air and that it doesn’t slip off the chair. A happy user adds that his lower back ache less often since he got this air-inflatable cushion seat and that it’s a necessity for anyone who spends eight hours driving. Another satisfied buyer comments that he has this air cushion seat for about a year and he doesn’t have any problems with air leaks. He recommends it as the best pressure relieving cushion. However, some drivers have complained that they have to inflate this air cushion often and that the quality of the material is disappointing. 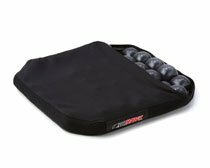 If you want an inexpensive air cushion, you might take a look at this trail seat pillow offered by Therm-a-Rest. Users love the price and that it’s foldable, but some do note they don’t feel any relief after using the cushion. This air-filled seat measures 16″ x 12″ unfolded, and 6.5″ x 2.5″ when folded. The cushion is 1.5-inch thick with a weight of 0.41 pounds, and it’s made of polyester and urethane foam on the inside. It’s self-inflating – you just have to open the black valve and wait. Moreover, it’s manufactured in the USA. 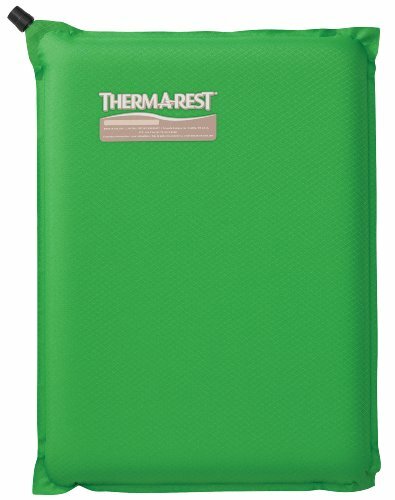 As a whole, users agree that the Therm-a-Rest air cushion is a product of high-quality and they praise its functionality and practicality. A buyer comments that this is the best air cushion that he has ever owned and that it’s far more efficient than the expensive gel cushions. The reviewer adds that you can fold this air seat quickly and put it in your traveling bag. Another happy customer shares that the seat is extremely comfortable and that it’s water resistant so that he doesn’t worry about getting wet. A purchaser adds that it’s easy to adjust the firmness of this self-inflating air cushion and that he carries it with on business trips. However, some customers have complained that this air seat is not very durable and that it started to leak air only after a couple of weeks. Some users also complain that it’s too hard to sit comfortably on it- but this may be due to the specific inflation-level. The first inflatable air cushion we took a look at was the Extend Medical Supply seat cushion. Extend Medical says that its waffle design is engineered to provide stress-free sitting experiences on account of its pressure-point elimination technology. This air cushion technology entails ring-shaped apertures in the cushion mean that your body weight is distributed evenly across the seating surface, eliminating the painful buildup of pressure throughout your body and lower back. Extend Medical also say that the included air pump makes it simple to inflate the cushion, and that it will also hold inflations for long periods of time, providing durable cushioning for bed sores. In general, some of the benefits include an easy portability, the elimination of painful pressure when you are sitting, an adaptive design to fit different seating surfaces, a rugged build material that resists air leakage, and an inflatable design that in some respects is more sophisticated than a foam or gel seat cushion. This waffle air cushion is ideal, the manufacturers say, to help deal with pain and discomfort associated with post-surgical recoveries, injuries to deep tissue, and general sitting pain management. One elderly buyer who weighs over 300 pounds says that this cushion has been a lifesaver her to her-she uses it as an inflatable chair pad. Another buyer we interviewed said that they even filled it with water to provide a different surface feel, rather than air. Another fibromyalgia sufferer we interviewed told us that they covered their waffle air cushion in a pillowcase so that it wouldn't slide around when its user fell asleep in his sofa chair. Another buyer we interviewed told us that they suffer from an autoimmune disease that creates general pain and malaise, especially when sitting. They have found that using this inflated air pillow relieves a lot of the painful sensitivity that was preventing her from a nights rest. Other senior citizen reviewers tell us that it's important not to over inflate the cushion- you'll want to take it easy when inflating it, really only using a couple pushes from the pump to get it inflated. This is because the way these cushions work is that once there's some air inside of them, and you put your weight on it, the air will disperse inside and conform to your body's shape. Another reviewer who suffers from lupus and obesity and says that their sitting life is much more sustainable- because they are stationary so much of the day, purchasing a wheelchair air cushion that was responsive to their autoimmune disorder was a necessity. Another reviewer we interviewed and said that they suffered from post-surgical bedsores and because they are so excruciatingly thin that they are bones could not comfortably settled on hard sitting surfaces. This is where air cushion technology helped the most- because of its low profile she was able to lay on top of it in bed the way she couldn't with higher-elevated cushions like donut-shaped options. The second option we examined was the Drive Medical adjustable air cushion. Drive says that their inflating cushion is specifically engineered to help distribute weight and pressure, increasing the sitter's blood flow to ensure that their tissue is healthfully maintained. It ships with a hand pump so that you can customize the level of inflation and body conformity to help you or the patient you are caregiving to achieve maximum comfort. As a pressure management tool, this is a high-end option from a renowned brand at promises to provide complete security and stability while ensuring the reduction and prevention of pressure ulcers. The third option we looked at was the Roho wheelchair cushion- it ships with a repair kit and an air pump and Roho includes a 24 month warranty. 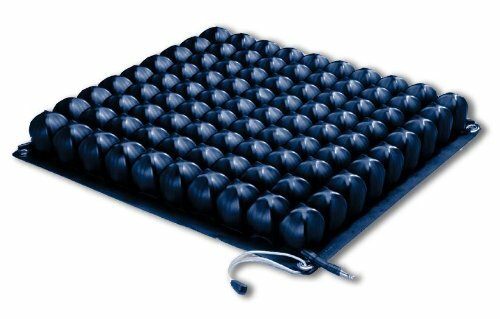 It measures 18" x 16" and is designed with high-profile air bubble cushions called 'cells' that are designed to therapeutically decrease pressure in the body, specifically indicated to decrease risk for the development of ischemic ulcers. Sometimes it makes sense to confer with a physician or physical therapist prior to purchasing one of these low-profile air cushions, specifically if you are looking to deal with pressure sores. One buyer we interviewed had purchased it for their elderly mother who was suffering from an advanced stage pressure wound. The wound was irascible, bloody and itchy, but soon after purchasing this Roho wheelchair cushion and inserting it into her Lazy Boy sleeping sofa, the bedsore began to decrease over the course of several weeks. Other reviewers concur, saying that many of the physical rehabilitation specialists they spoke with endorse it as a premier option for preventing skin breakdown. The fourth option we took a look at was the Roho Airhawk truck comfort cushion- this one is specifically designed for long haul truck drivers, construction personnel, basically anybody who is behind the wheel for long periods of time. It measures 19" x 19" and is designed to help improve your posture when sitting, as well as managing lower back pain and general discomfort. Roho says that this automotive pain management cushion is designed to help you deal with the uncomfortable sensations of fatigue, numbness and pain that comes with extended driving. The interconnected air cells facilitate the flow of air from each chamber, helping to redistribute your body pressure weight while promoting a healthy blood flow. The pockets of air are great for absorbing the painful vibrations from driving on rough roads that are known to create spinal cord compression as well as lower back pain. Reviewers say that this is a great wheelchair cushion in addition to being a rubber-gripping, low-friction option for bus drivers, forklift operators, cabdrivers and other people stuck in a seated position for prolonged periods of time. Many drivers we spoke to say that this Airhawk automobile cushion has helped decrease the pain that they feel after driving hours and hours, sitting in one painful position. Buyers suffering from sciatica, lower back injuries and spinal problems have described this automobile cushion as a lifesaver-enhancing their quality of life and enabling them to get back on the road, or even sit more comfortably in regular sitting chairs or wheelchairs. The last option we took a look at was the Therm-a-Rest Trail Seat. This air cushion is designed for camping, sitting on hard stadium benches or for long car drives- it is a self-inflating option that measures 16 inches long by 12 inches wide and 1.5 inches thick. One disabled buyer we spoke with said that they suffered from hip pain and sciatic pain- they were highly pleased with this option, saying that its adjustability was one of its high points, enabling them to customize the feel of the cushion. Another reviewer purchased some for their grandparents saying that sitting for a long period of time on hard surfaces is a serious risk injury for them- and because this option is so easy to inflate and deflate, it's a cinch to transport to stadiums or just keep rolled up in your car's glove compartment. Some buyers spoke of using it as a wheelchair cushion, but you should always confer with a physician if you're looking to use this cushion for pressure sores. Another reviewer we spoke to says that they were dealing with general soreness from air travel- sitting in an uncomfortable airplane seat compressed their spine and created nagging postural difficulties as a result. They invested in this cushion because of its portability, inflation adjustability and its proven capacity to decrease the experience of pressure pain from prolonged sitting.